A fireworks display will once again be part of the Village of Jeffersonville’s July 4 celebration. The Village of Jeffersonville will celebrate Independence Day with a block party, parade and fireworks this year. The fireworks will be sponsored by the Jeffersonville Lions Club “with support from the community,” according to Jim Downing, assistant treasurer of the club. The fireworks will be provided by Hamburg Fireworks in Lancaster and the show will start between 9:45 and 10 p.m. on Wednesday, July 4. Downing said he expects “several thousand people” to watch the fireworks this year. Before the fireworks, there will be a block party at the corner of Main and High streets. The party will last from 5 to 10 p.m. and will feature fun for the whole family, according to Tracey Coe, co-chairman of the Jeffersonville Festival Association. One big attraction to the block party is the hot dog eating contest, which will be held at 6 p.m. There is a $5 entry fee to participate in the contest. There will also be a dunk tank featuring local celebrities. Half of the money raised by the dunk tank will be donated to the charity of the celebrity’s choice. Live music will be performed by the Temple Street Howlers, a local Fayette County band. At 8:15 p.m., there will be a Fourth of July parade. The block party will conclude with the fireworks display. 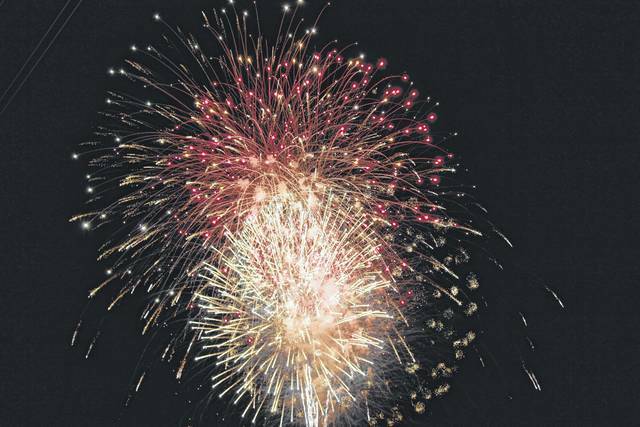 https://www.recordherald.com/wp-content/uploads/sites/27/2018/06/web1_JeffFireworks1.jpgA fireworks display will once again be part of the Village of Jeffersonville’s July 4 celebration.